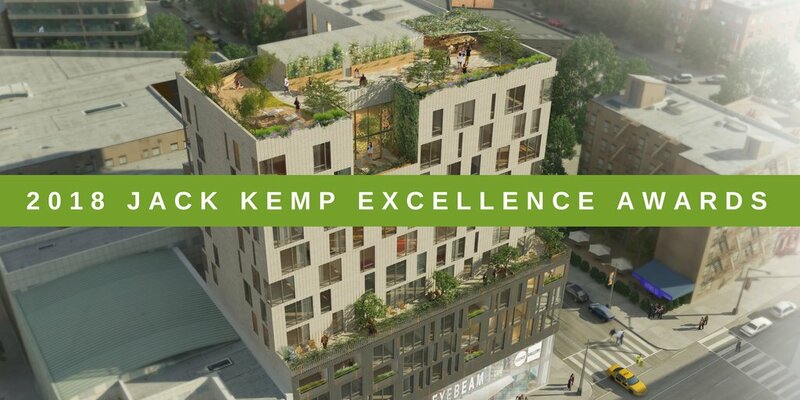 We are excited to announce that Avenue has been selected as one of five winners chosen for the 2018 Jack Kemp Excellence in Affordable and Workforce Housing Award given by the Urban Land Institute (ULI) Terwilliger Center for Housing. This National award honors exemplary developments that preserve affordability for people at multiple income levels, specifically households earning less than 120 percent of the area median income (AMI). The award recipients were announced at ULI's Fall General Session in Boston this week, and Board Member Jamie Bryant was on site to represent for Avenue. Avenue has been recognized for two of our affordable communities – Avenue Place and Avenue Terrace – both located in Houston’s historic Near Northside community. Located just minutes from Downtown Houston, Avenue Place and Avenue Terrace provide working families safe, quality affordable homes in the heart of the city’s urban core. At Avenue Place, 49 of the 85 homes currently constructed are restricted to homeowners making 120 percent or less of the Area Median Income (AMI), while 162 of Avenue Terrace’s 192 units are restricted to renters making 80 percent or less of the AMI. Low and moderate-income homebuyers at Avenue Place may also be eligible to receive Down Payment Assistance (DPA) through Avenue, which is available to income-eligible families earning 120 percent or less of the AMI. In addition to affordable living, Avenue Place and Avenue Terrace also offer residents access to a variety of on-site support services, including after-school programs and community enrichment initiatives. The communities are also situated in close proximity to several neighborhood landmarks including the community park and walking trails at Avenue Place, M.D. Anderson YMCA, Carnegie Library, Irvington Park, Moody Park and Recreation Center, and the METRO North Corridor rail line, which connects the Greater Northside community with key districts including Downtown Houston, the Museum District and Texas Medical Center. When Avenue was named as a finalist earlier this year, Terwilliger Center Founder and Chairman J. Ronald Terwilliger highlighted the significant role that affordable development plays in strengthening communities and emphasized the benefits that these developments offer the surrounding neighborhood. Click HERE to view and download the full press release.